© 2001 Estate of Alfred Jensen/Artists Rights Society (ARS), New York. Photograph by R.H. Hensleigh. 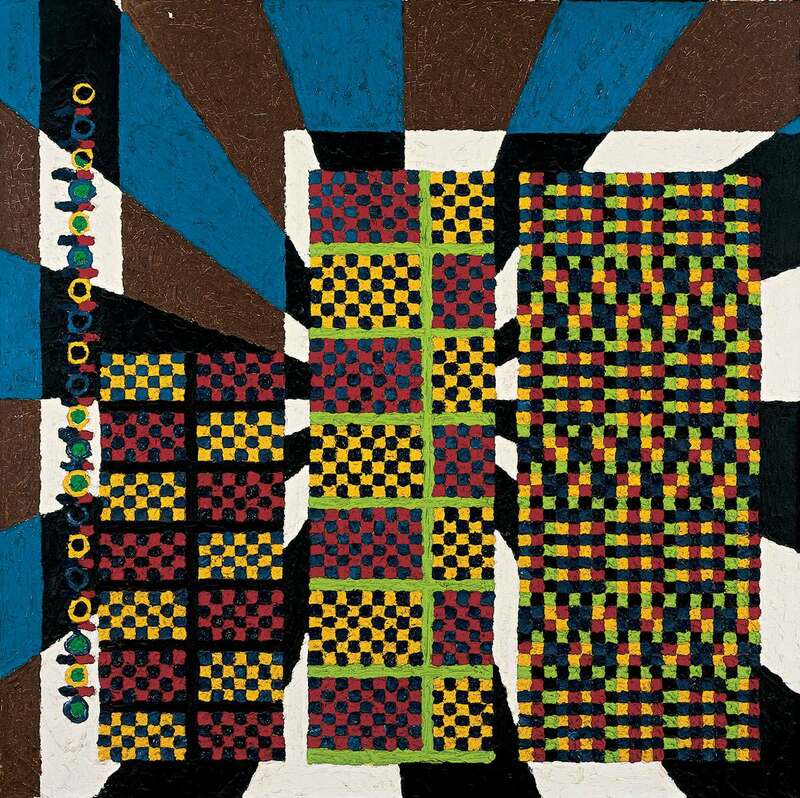 Emblazoned with brilliant “checkers” of prismatic color, the paintings of Alfred Jensen are hard to categorize, and even harder to decode. Formally related to Hard Edge Abstraction, Op Art and the “sign” phase of Pop Art, his paintings embody mythical meanings that reference, among other fields of knowledge, Peruvian, Mayan and Egyptian calendars and architecture; ancient Chinese and Greek mathematical and numerical systems drawn from the I-Ching and Pythagoreanism; physics and astronomy; the color theories of the German writer Goethe and the French theorist Michel Chevreul; and the optics of the prism. Born to a German-Polish mother and a Danish father, Jensen was raised in Guatemala City and Denmark. After traveling extensively as a seaman, he began his formal art training in California before traveling to Munich to study for a year with Hans Hofmann. During the next twenty-four years, he traveled and studied throughout Europe, North Africa and the United States with his patron, the wealthy art collector Saidie Adler May. Atlantis, Per II is a culminating example of Jensen’s early mature style, without the incorporation of numbers and symbols that would characterize his later work. It is one of the few paintings in which he breaks the flatness of the surface and creates an illusionistic space with radiating black and white diagonals. Floating on top of this one-point perspective are three rectangular “checkerboards” with their checkers arranged in a highly systematic and ordered manner. As in most of his paintings, the paint is not mixed. The title references the legendary continent of Atlantis, which is supposed to have sunk into the ocean. Atlantis, Per II (the second of three paintings in this series) was painted the year after Jensen and his wife, Regina Bogat, honeymooned for six months in Europe and Egypt where he pursued his interest in ancient civilizations. Combined with his ongoing research into Mayan architecture and hieroglyphic writings, and his love of arcane texts such as Ignatius Donnelly’s Atlantis: The Antediluvian World (1882), Jensen saw similarities in the architectural plans of Mayan and ancient Egyptian temples and enjoyed exploring the improbable idea that Atlantis was the missing link. Perhaps we can read the systematic order of the checkers as emerging from or receding into the illusionistic depth of the sea, a myth of creation or destruction. Although Jensen’s conceptually layered works were more widely exhibited in Europe, especially Switzerland, he nevertheless had a high profile in the United States with one-person shows at the Guggenheim Museum (196l and 1985) and the X IV International Biennial of Sao Paulo (1977) where he represented the United States, an exhibition that the Albright-Knox Art Gallery reorganized as a traveling retrospective in 1978. Now, two decades after his death, with a major retrospective at the Dia Center for the Arts in New York (2001-2002), there is renewed enthusiasm for what Grace Glueck calls the “color-drenched puzzles” of Alfred Jensen.